GM CEO Rick Wagoner and Michigan Gov. 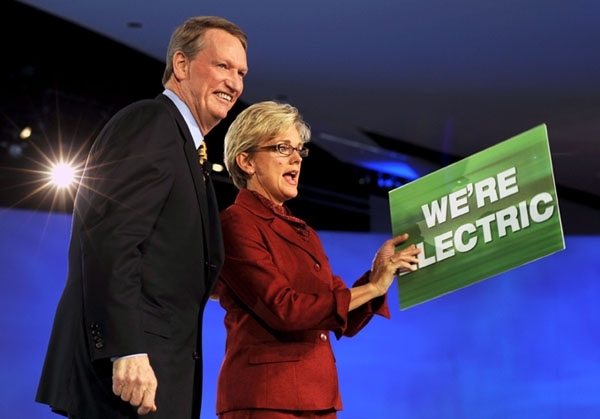 Jennifer Granholm lead a parade of GM employees and vehicles to kick-off a GM press conference at the North American International Auto Show in Detroit on Jan. 11. 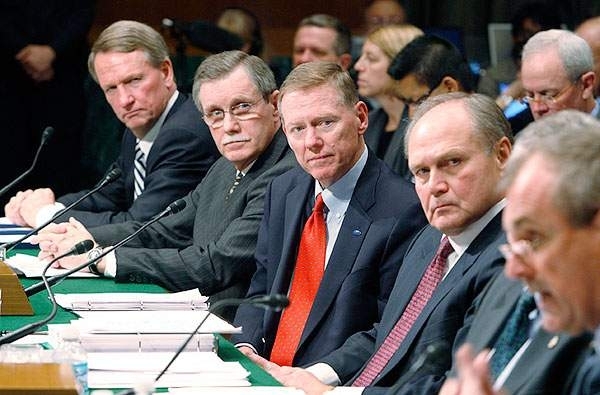 LEFT TO RIGHT: Richard Wagoner, chairman and CEO of General Motors, Ron Gettelfinger, President of the United Auto Workers International Union, Alan Mulally, president and CEO of Ford Motor Co., and Robert Nardelli, chairman and CEO of Chrysler LLC, listen to the testimony of Keith Wandell, right, president of Johnson Controls, Inc., during the U.S. Senate Banking, Housing and Urban Affairs Committee hearing on Dec 4. 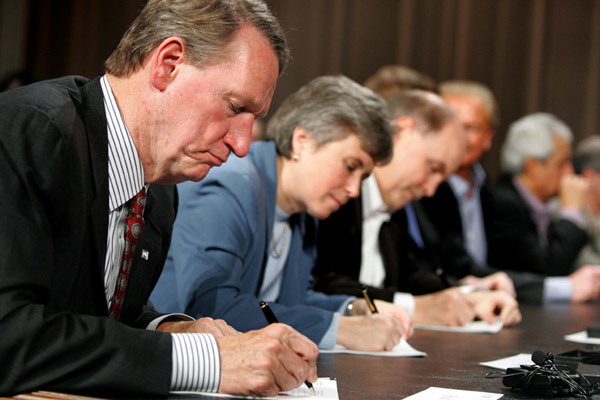 Wagoner and his senior leadership team sign the 2007 UAW-GM national labor contract at a special ceremony held at the UAW-GM Center for Human Resources in Detroit on November 12, 2007. Wagoner and Golfer Tiger Woods talk backstage before introducing the 2008 Buick Enclave luxury crossover SUV Nov. 28, 2006, in Pasadena, Calif. Woods was a Buick endorsee at the time. 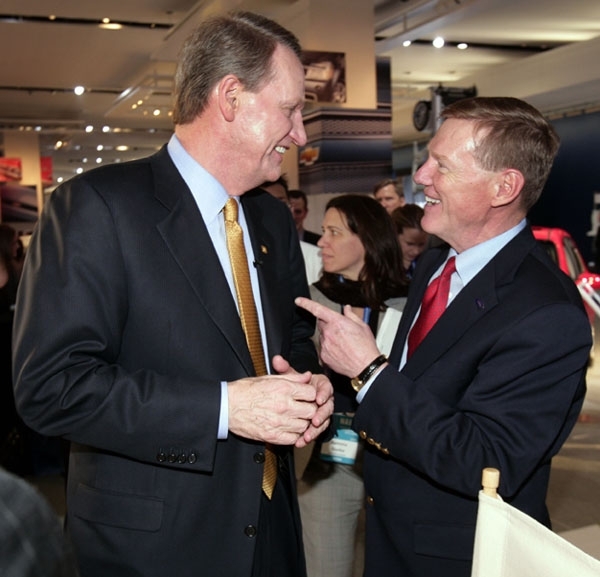 Wagoner (left) is greeted by Ford Motor Co. President and CEO Alan Mulally in the GM exhibit at the 2008 North American International Auto Show Jan. 13, 2008. 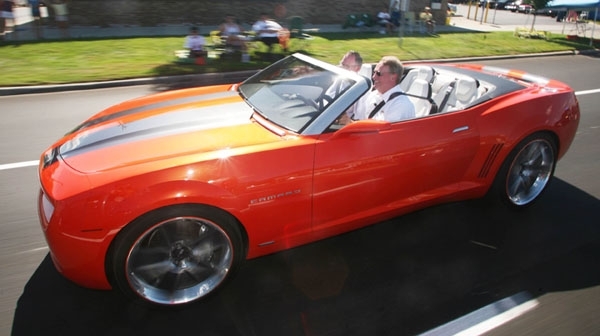 Wagoner (right) and Chevrolet General Manager Ed Peper drive the Chevy Camaro convertible concept along Woodward Ave. as part of the Dream Cruise in Royal Oak, Mich., in August, 2007. 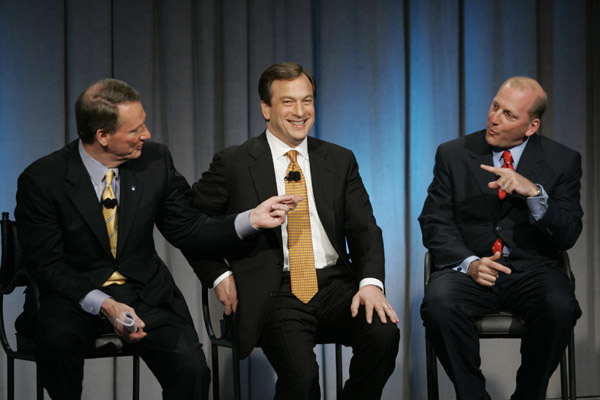 Wagoner, left, General Motors Acceptance Corp. Chairman and CEO Eric Feldstein, center, and Cerberus Capital Management COO and Senior Managing Director Mark Neporent talk with the media on April 3, 2006, after announcing GM's sale of 51-percent controlling interest in GMAC to a consortium of investors led by Cerberus Capital Management, Citigroup Inc., and Aozora Bank Ltd.
General Motors Vice Chairman Bob Lutz, left, Wagoner, center, and GM Vice Chairman and CFO Fritz Henderson talk before the start of a Cadillac press conference at the 2008 North American International Auto Show. 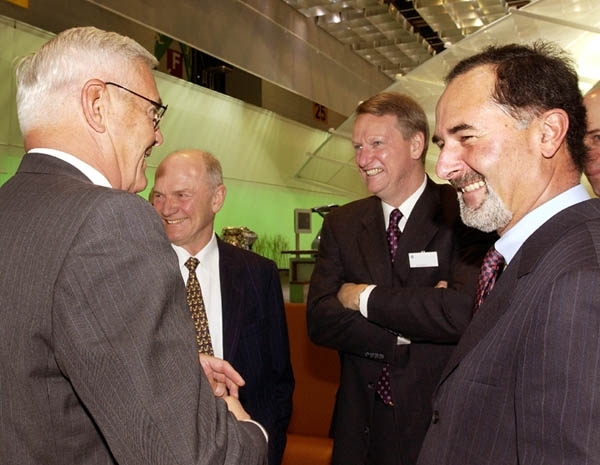 General Motors Vice Chairman Bob Lutz, left, and Wagoner, second from right, meet retired Volkswagen Chairman Ferdinand Piech and then VW Chairman Dr. Bernd Pischetsrieder, right, during a tour of the 2004 Geneva Motor Show. Wagoner, left, Rev. 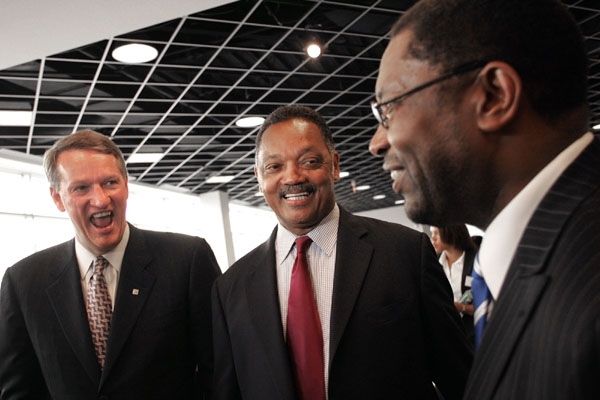 Jesse Jackson, center, and Chevrolet-Saturn of Harlem Owner Otis Thornton share a laugh during the grand opening of the Cheverolet-Saturn of Harlem dealership in New York, June 2, 2006. It was the first auto dealership to open in Harlem in more than 40 years. 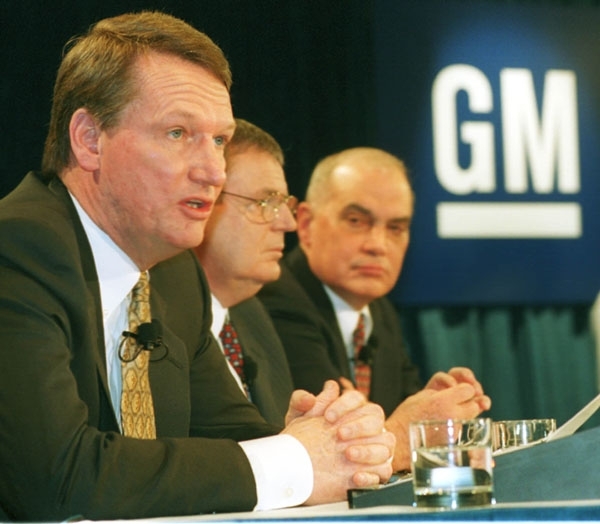 In 2000, General Motors President Rick Wagoner, left, answers questions after it the announcement that he will become CEO of GM. 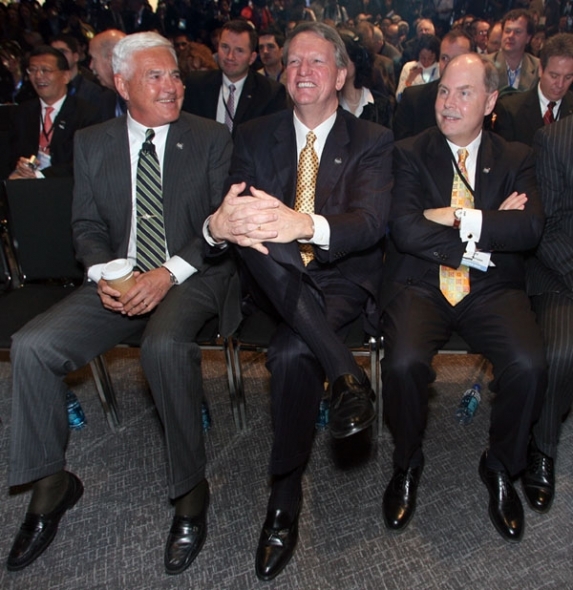 He is joined by Chairman Jack Smith, center, and Vice Chairman Harry Pearce.